The garden has been open to the public on Wednesdays and Fridays throughout the year. Wednesdays have been styled as ‘Women and young families day’ making a particular attempt to offer a safe space to Somali women, while still welcoming everyone. Fridays are a ‘general’ day. Several volunteers made substantial contributions over the year. For example, one local lady of Bangladeshi origin, planted and tended a cultivar of Chinese pumpkin that proved extraordinarily fruitful and was remarked on by many. The large polytunnel exhibited over 30 species of tomato through the summer. We also had regular visits from those who simply wanted to enjoy the garden, including one mums and toddlers group (average ten adults and ten children) that would come and have a picnic there in the summer. Work has begun on a forest garden and a wild play space for children. Throughout our first growing season we welcomed an average of eight people in the garden each day it was open. 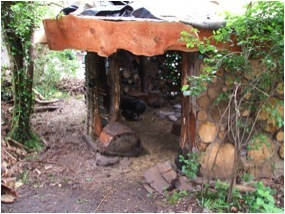 We engaged Pete Lloyd, a traditional craftsmen to work with the community to build an outdoor shelter in the courtyard area that could be used for cooking but also a more general workshop space. Pete’s course was popular (over two hundred people visits to the garden) and the results were beautiful . 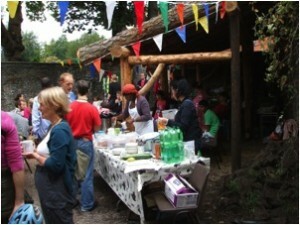 The kitchen had its first workout at the Homemade Festival in 2011. Many of the community volunteers in this building project were from the neighbourhood partnership area, eg from Easton, but few from the immediate Barton Hill area. We are currently (Augst 2012) fitting out the outdoor kitchen including a clay oven and range with design features that have been developed by local people. The outdoor kitchen has been used for lunches throughout the summer period, particularly on Wednesdays when there were often around 20 local people present, including many from the Somali community. We piloted a ‘Homemade Festival’in September 2011, celebrating all things home made and homegrown, planned and organised by a coalition of many local organisations, including Barton Hill Settlement, the Ashley, Easton and Lawrence Hill Neighbourhood partnership, Wellspring Healthy Living Centre, Somali Resource Centre and St Luke’s Church. This involved closing the road outside the Walled Garden, sharing food across cultures, displaying arts and crafts, entertaining each other with unplugged music and giving informal tours of the garden. This attracted around 150 people and a later review showed it was overwhelmingly positive and people want to do it again. This is being repeated in 2012. Building on the success of the outdoor kitchen, we asked Pete Lloyd to help us build a roundhouse in the lower garden as a reflective space. Despite inclement weather a good number of people have turned out to make this happen, and an extraordinary structure has taken shape out of wood and earth . The truly surprising feature of this space is how many people feel ‘at home’ in it, even people from very diverse cultures. It is already a popular meeting place. The Homegrown Project: Our Somali outreach worker Daahir Mohammed conceived and initiated the ‘Homegrown project’, based at the Walled Garden, designed to encourage people to grow food in their own garden spaces in the local area. 20 interested people were visited in their homes, our professional growers were consulted, then Daahir and Rachel helped to advise the local people on what they could do. Despite an inclement growing season, the project has gone well and has led on to other things, including a tool club based at the Walled Garden for the people of the area. Bloomin Hill: The local landlords forum conceived a project to offer hanging baskets to the residents of Barton Hill. The Walled Garden was invited to help deliver this and we offered three workshops and developed a display area in the courtyard. More than thirty hanging baskets were provided to the area and we have ongoing relationships with some of the recipients. Our Wednesday ‘Women and young families day’ has a particularly strong relationship with the asylum seekers allotment project in St George, which is run by Bristol Hospitality Network and also with a new Somali allotment in Royate Hill, which the Somali Resource centre (in Barton Hill) are responsible for. Our workers Tim Lawrence and Daahir Mohamed are involved in all three sites and have been important in their formation. This coalition of interests has recently formed ‘The Three Leafed gardening Collective’ and won a three year grant from Tudor trust to train new garden leader/community development workers at all three sites. Without trying to seek wider publicity, the Walled Garden Project has attracted attention from across the city and has received two particular awards in 2011. 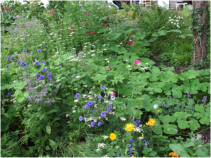 Bristol in Bloom 2011, gave an award at their second highest level for community projects, judging the Walled Garden as Level 4 ‘Thriving’. Bristol Green Volunteers made The Walled Garden their ‘Project of the Year’ and celebrated this with a gift of £1000. 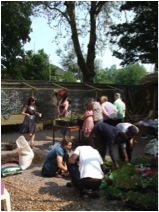 We also featured in Bristol’s ‘Get Growing Trail’ in 2011 and 2012. We are very pleased with the progress of the garden and its developing relationship with the local community, in particular, our strong links with local Somali people. St Luke’s Church played a significant part in our first Homemade Festival . Chris Sunderland has contributed to a festival service at Bethesda Methodist church and will be preaching at St Luke’s Harvest Festival service this year. Our Tudor trust funding has assured our work on Wednesdays for three years. Quartet Community Foundation provided funding for the Roundhouse. We are developing applications to establish the work on Fridays through a partnership with Wellspring Healthy Living Centre. After some planning and preliminary work on our part, the Diocese have decided not to pursue rainwater harvesting from the main house. We plan to apply funds remaining from this to other elements of the project. A website is being developed, and carries information about our supporters. We are grateful to Temple Trust for their ongoing funding of this work. Trustees are always welcome to come and take a tour of the site. Further information can be obtained from Chris Sunderland, The Coordinator of Project Agora, 50 Guest Avenue, Emersons Green, Bristol BS16 7GA or chris.sunderland@agora.uk.com or mobile 07929090153.